Looking for a residential or commercial mover in Maryland, DC or Virginia? From moving and packing to everything in between we can assist with you next relocation. Driving around the Washington, D.C. metro area can be tough enough on most days. For many people, moving their residence or commercial space around the metro area can be a nightmare. Artisan Movers is here to help make your next move a breeze with our top rated moving services. We are your one-stop shop for all of your relocation needs: from local to long-distance residential and commercial moving, we even offer packing services and materials to make everything as easy as possible for our customers. needs with the most respect, candor and transparency. We provide free estimates for your moving needs and we are licensed, bonded and insured from end to end. 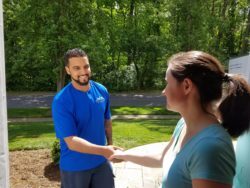 If you’re looking for movers in Maryland or movers Northern VA, look no further. We offer additional services to make your move as stress-free as possible. In addition to a visit to your location beforehand, we also offer safe and dependable storage options for our valued customers. Washington is known for the transiency of many of its residents, and we are happy to offer storage for people who might need to leave some property in limbo in between their moves. Our storage options are securely monitored and climate-cooled and we offer the flexibility for your short-term and long-term needs alike. We also offer services to help with your move outside of the metropolitan area. We take care of long-distance moves of all sizes, for both residential and commercial clients. From new homeowners moving out of their studio in the city to others downsizing as they move to another city – we offer every service to fit your specific moving needs. Our long-distance moving can make your relocation especially easy, as we’ll provide you with labels to indicate precisely where you want your belongings in your new location. We’ll make sure everything is in the appropriate location in your new space, so that you can save time and manpower and get right to work. It’s well-known that large commercial moves can be a headache. Whatever your business or firm specializes in, you shouldn’t need to make your staff become moving experts for one move across the city. You can find all of our commercial moving services, tips and ideas on our website and we are happy to provide you with a quote based on your specific moving needs and preferences. We treat your business like its ours, and we help you think through all of your moving needs thoroughly and professionally. We can provide you with a moving checklist as soon as you contact us, and we can help you take care of everything you need in your next move. We’re happy to consult with you every step of the way, and offer each of your employees a moving package for their specific supplies and moving needs. We provide floor and wall protection, workstation disassembly/assembly and whatever else you and your staff may need to make your move successful. We can come to your home or business and make it so easy that you don’t even need to lift a finger. With all of the best moving supplies and materials, we can pack everything up at your location in Maryland, Virginia or Washington and relieve you of countless hours of additional work. Our experts have all of the supplies you could want to pack large valuables, delicate antiques and knick-knacks of all shapes and sizes. We’re happy to come to your place of residence or business and take care of all of your packing service needs on the spot. For many people, moving can be a rare venture. You might not even know what supplies you need or what questions to ask. We pride ourselves on being community movers who look out for the best in our clients. Our customer service representatives are happy to answer your questions over the phone and help you think of the moving needs you might not even have considered yet. We give back to the community through charities and treat our clients like they’re our neighbors – because they are. Artisan Movers are reliable, trustworthy and guaranteed to make your next move as easy as possible. Your next relocation can be easy and affordable with Artisan Movers. If you’re looking for reliable movers in Rockville, Maryland, Virginia or Washington, D.C. check out our extensive information available online such as our tools and tips page or go direct to our moving checklist which is the most comprehensive checklist of its kind around. Call us today or simply request a quote here to learn more about moving with Artisan Movers.